You’ve probably got a fantastic hotel that you want to show off. You’ve got all the lighting set up; the frontages are looking fantastic, and the gardens are superb. So, you get ready to start taking your photos. Very often, the artistic flair of a photographer can mean that they miss out on the one thing that makes hotels what they are. They are missing people. People are the lifeblood of your hotel, without them you don’t have a business, and yet so many amateur photographers go out of their way to miss them out of photos. There are many reasons, but one of the most common is that they are simply looking for a clean line. They don’t want it to be messed up by scruffy types or kids running across the grass. The thing is, your customers probably do want to see that. So how can you breathe life into your hotel photography and still maintain a clean and professional look? The easiest way is to stage it. You could get members of staff to dress as ‘civilians’ and set them in poses around areas of your hotel to show it off. It’s usually best to make sure they’re doing something such as drinking or eating. Otherwise it can look awkward. However, this can be a really easy way to give the impression of ‘action’ in your hotel. This also means you can have complete control over how the photos look. You can’t order members of the public around, but you can ask your staff to stand here, move there, hold this, etc. And finally, it gives you time. Patience is a virtue in photography and it pays to wait for the best lighting or for the wind to drop so hair isn’t blowing all over the place. It’s possible to add some lighting effects in PhotoShop, but nothing beats capturing the moment there and then. You’ll need to get permission first from the people you’ll be photographing, but often the best way to capture motion is to photograph an event. Hotels are usually booked out with events, and it’s good to show that yours is too. Weddings are ideal, as people will often be dressed up, no scruffy youths here! You’ll also get your fair share of elegant dresses and hats in different colours. Choose wisely and you may be able to match clothing colours with certain areas of the hotel to create something really special. However, be careful you don’t annoy the people you’re snapping. Be courteous and don’t ask for too much. The final, and most expensive method is to hire models. Although this will cost you quite a bit, it does mean you get professionals who are used to being told what to do. They may also have some ideas themselves. The result is the same with any of these options. 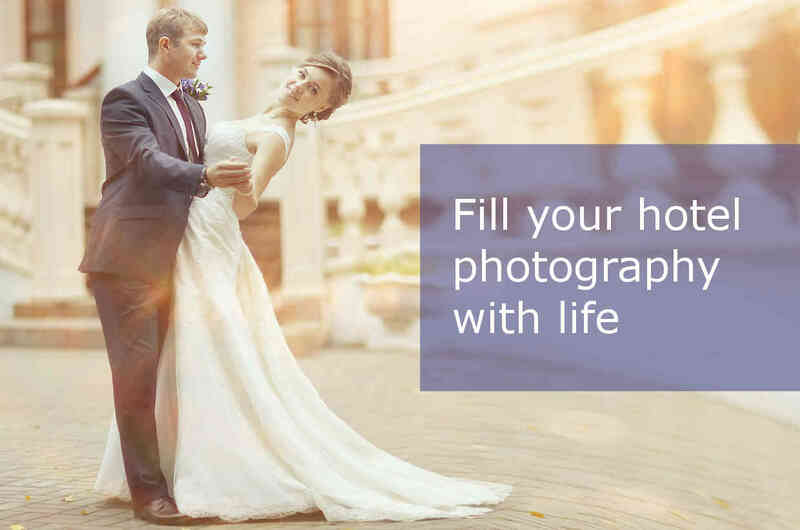 Put simply, adding life to your hotel photographs can actually help you get more bookings, so don’t shy away from it.